Maybe you want a touring bike that’s like nothing else out there. 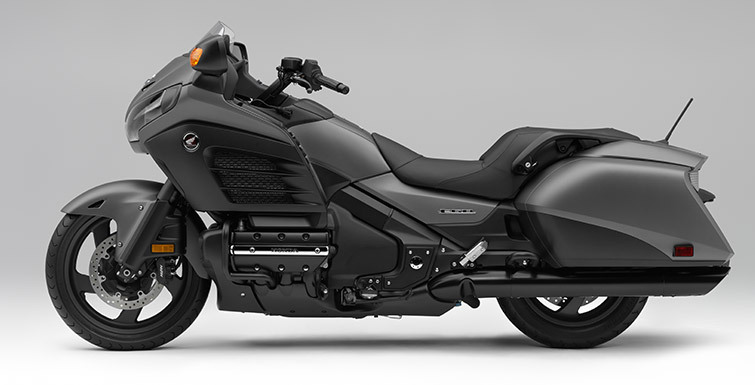 Maybe you want a cruiser that’s not a cookie–cutter clone. Maybe you just want a bike that’s big enough to take you wherever you want to go, and do it in comfort and style, with plenty of class and independence. 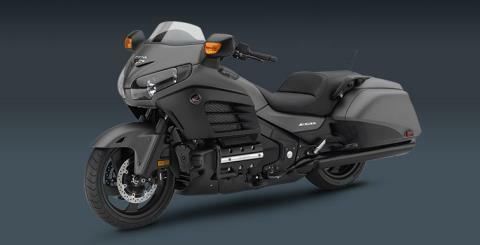 If that’s what you’re after, Honda’s Gold Wing F6B is your kind of bike. Big, smooth, powerful. The Gold Wing F6B uses technology gathered from our own Honda Gold Wing, a bike that’s set the standards in Luxury Touring for the last 40 years. But the F6B is lighter, trimmer and leaner. 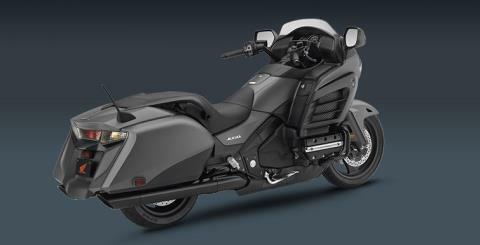 You’re going to find that it’s perfect for around-town rides, shorter trips or weekend getaways. You’re also going to find that it will blow away just about any conventional cruiser in terms of looks and commanding presence—not to mention on-road performance. You asked for it, so here it is. And the F6B is still available in two trim levels—standard and deluxe with a new Matte Pearl White. With plenty of storage capacity and with many of the Gold Wing’s comfort and luxury features, the F6B is ready to take you wherever adventure calls. Isn’t it about time you answer? EXHAUST SYSTEM: Baggers have a little attitude—and the F6B sets plenty of records in that department, thanks to an exhaust internals that give it a throatier, meaner sound. SPACIOUS STORAGE: Creating a high-performance touring bike means paying careful attention to the art of packing. The Gold Wing F6B’s twin saddlebags are mounted low for a better center of gravity, sealed to be weather resistant and lockable to deter thievery. Offering 22 liters of space, there’s ample room for the stuff you need to enjoy every trip. 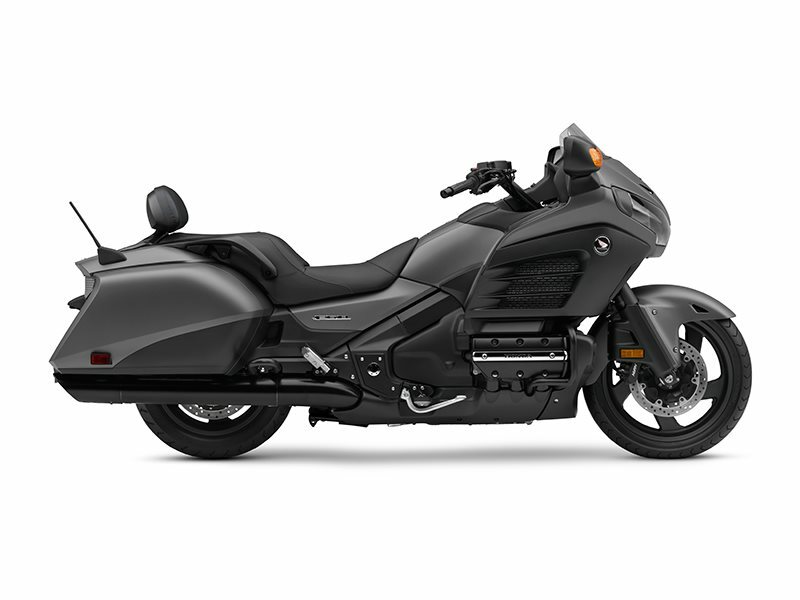 IPOD® CONNECTIVITY: The Gold Wing F6B has an unbeatable sound system, so don’t forget to pack your music. Now you can connect a compatible Apple® iPod® player and control it through the Gold Wing's audio controls, or you can plug in a USB flash drive MP3, WMA6 or AAC music files. 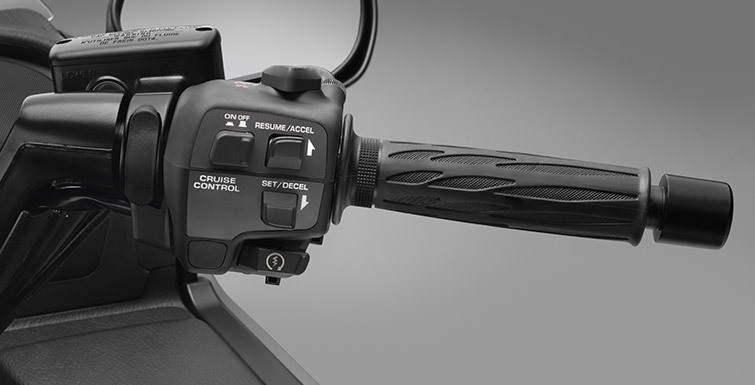 The connector is located in the lockable saddlebags, where devices can be conveniently carried and discreetly stored. LONG-DISTANCE SEATING: You don’t design a comfortable seat for two without putting in real miles, and Honda engineers have racked up millions of them. 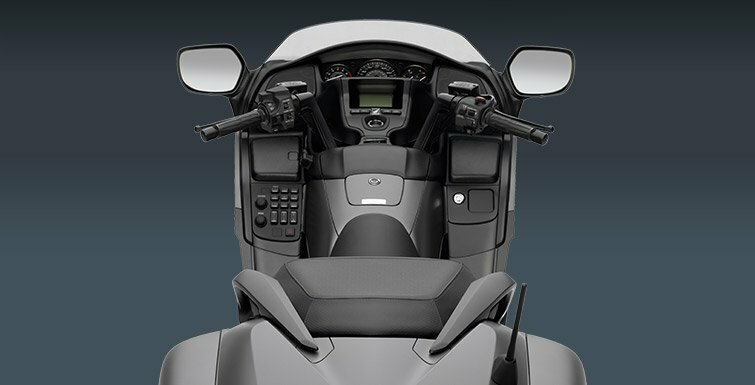 Our experience and testing have created a seat design that gives the rider just enough back support while providing the passenger an elevated view so they can see more than the back of a helmet. The F6B’s carefully tuned padding and shape mean more pleasure from more miles in the saddle. ADJUSTABLE SUSPENSION: On a touring motorcycle, how much weight you carry constantly changes. Passenger or no passenger, loaded or empty saddlebags: you need an adjustable suspension that’s also easy to adjust. The F6B features a rear Pro Arm® single-side swingarm with Pro-Link single shock. Best of all, the spring-preload adjustment is remote-controlled. 1832CC LIQUID-COOLED, FUEL-INJECTION ENGINE: Sometimes a powerplant rises above the merely functional and becomes an icon for superior engineering. It is this engineering that powers the Gold Wing F6B. The technically savvy are impressed with its electronic programmable fuel injection, its compact flat-six design, how it’s horizontally opposed for smoothness and the fact that all this is achieved with regular unleaded gasoline. 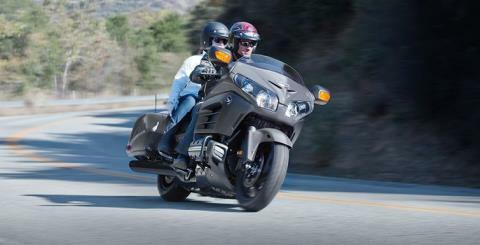 Even more impressive is the character this liquid-cooled, 1832cc six gives the Gold Wing F6B—effortless, comfortable, and completely competent year after year. ADVANCED WIND AND WEATHER PROTECTION: At first glance, the F6B looks bare of wind and weather protection, but on your first ride, you understand its radical bodywork. 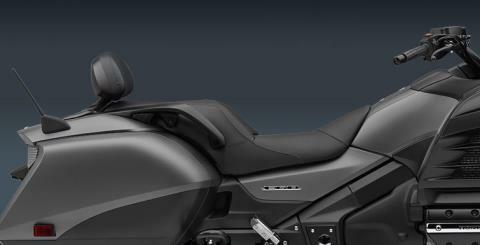 Through careful design, rider and passenger are shielded from wind, cold and rain. This is a carefully tuned fuselage that deflects the environment and vastly improves rider comfort. 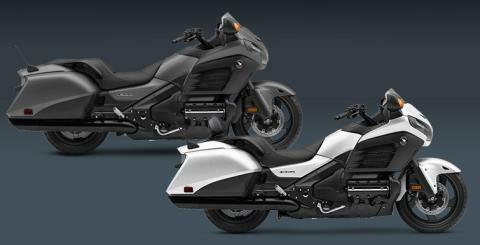 It’s part of what makes a Gold Wing world-class touring machine. 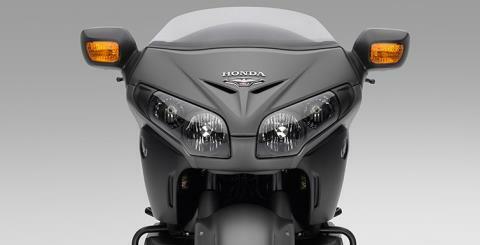 AGGRESSIVE STYLING: It’s like no other Gold Wing we’ve ever made. The F6B features sleek, super streamlined bodywork with a lower, swoopier profile that sweeps back from the minimal windscreen to the low rear cowl right where the trunk could have been. And where other bikes have chrome, the F6B is pure blacked-out metal, from engine casing to the cast wheels. GLOVEBOX WITH GLOVE REACH: Because all Gold Wings feature a low-mounted fuel tank, there’s additional storage room right in front of the rider. It’s easy to access this convenient storage, and it’s lockable for items like your cell phone, GPS or camera for scenic turnouts. CRUISE CONTROL: Perfected on our Gold Wing touring bikes, the F6B’s cruise control offers a full range of features: set, resume, step up and down. It works seamlessly, and it makes this smooth-riding machine seem even smoother, and it a real benefit on long, straight highway sections. 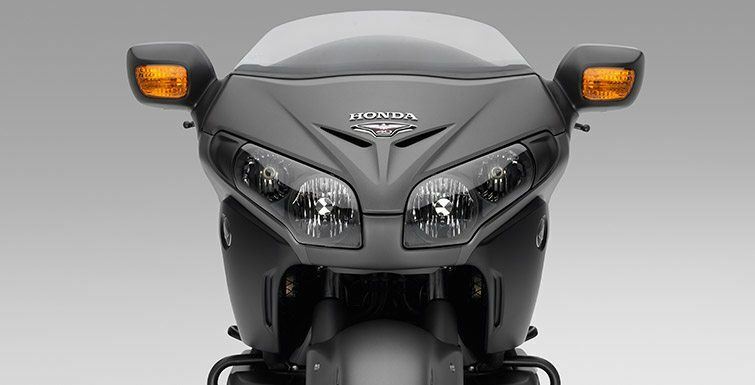 LOW-PROFILE WINDSCREEN: When it comes to engineering, Honda has unmatched resources. Countless hours in our research facility wind tunnels led to the F6B’s revolutionary windscreen. With its minimal design it saves weight, eliminates a prime cause of wind drag and delivers absolutely amazing wind and weather protection. Riders will also love how open the cockpit now feels.